Small scale cattle production can be a very successful and profitable enterprise for small farms and ranches with pasture. Cows are excellent, efficient converters of grass into either milk and/or meat. And local demand for both dairy and beef are only growing stronger. However, it's not a slam dunk. Many areas have a variety of obstacles, either logistical, regulatory and/or economic in nature. We'll take a look at all the opportunities, and challenges, for small scale cattle production. In addition to meat and milk, cattle are perfectly capable of providing additional benefits to a small family farm or ranch. Draft power, manure/compost production, pasture improvement, soils improvement and heat production are all under-utilized benefits of having cattle. Even heritage breeds are making a comeback, and calves or breeding stock of those breeds can be a niche product. We'll take a look at all these options for small scale cattle production in more detail, in the following sections. Beef Production Steers can convert grass and sunshine into meat within two years, and considerably less with veal production. For small farms and ranches with good pasture, cattle can be a very good way to optimize that production. 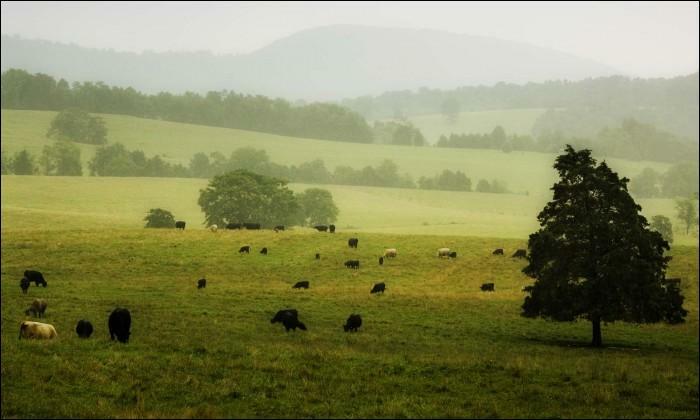 For operations with only fair or even poor quality pasture, cattle can be used as part of a pasture improvement program to provide both meat and improved grazing. We'll take a look at these related topics. Dairy Production Demand for local dairy and raw milk are driving a return of small scale dairy operations. Dairying can be a very demanding enterprise with a lot of regulatory oversight. But when ra milk and/or local dairy products are attracting prices well above commodity fluid milk, those demands can be worthwhile. Click here for more information about the pro's and con's involved with small scale dairy production. Draft Power Our cows are not trained to harness, but any male calves they provide will serve on the farm as draft animals. Click here to learn more. Heritage Breed Protection It would have been very easy to acquire more common breeds such as Holstein or Jersey cattle. So why did we make such an effort to get Milking Shorthorn? Click here to learn more about heritage breed conservation. Land Building Our farm sits on the side of a hill, and the topography is very uneven. We hardly have a flat spot on the property. So our cows are land-builders. We accomplish this by housing the cows in a small yards and feed them their hay on the ground. The combination of waste hay, manure and bedding can build up very quickly, and will fill in any low spots we happen to have in that yard. When their current yard ground level has been sufficiently built up, we move them to another yard and the cycle begins again. Animal Feed We are not yet licensed for retail milk sales, but our cows' milk is used in a wide variety of ways. We save colostrum after each calf's birth which can be used as substitute colostrum for youngsters of other species. Our pigs also thrive on cow's milk as a valuable source of calories, protein and other nutrients that are costly to provide from other sources. Soil Inoculation Soils are living, breathing collections of macro- and micro-organisms. When starting with bare or abused ground, sometimes that ground needs to be inoculated with new bacterial cultures. Cow manure, well managed, can give soils a potent boost of both microorganism populations as well as organic matter. Combine that with the right ratio of carbon-rich bedding, and cows can lay down a sheet of living compost wherever they go. You can't buy that kind of soil fertility, not at any cost. Radiant Heat Production Cattle are basically walking compost piles. An individual cow's rumen volume is considerable, and the heat her body puts out is also considerable. In cool or cold climates like we have, that heat source can make a nice difference in winter housing conditions. Click here to see how we're using that radiant heat source to keep our other animals comfortable during cold weather. Compost Production Compost is critical to preserve and improve soil condition. While various soil amendments can be purchased and applied to correct specific shortages, compost is one of the few things that can improve both soil tilth and microbial soil life. Our cows' waste is either applied directly, as described above under Soil Building, or it is composted for use later throughout the farm. Click here for more information on that process. Compost Heat Production One of the most exciting ideas we've seen in a long time is converting cow manure into heat. I'm not talking about some hi-tech multi-million power production facility. Instead I'm referring to low-tech methods to harness the heat generated during composting, for a variety of household and farm purposes. Click here to learn more about how we're using cow manure to provide that heat. A lot of what we're doing here isn't exactly conventional. But we have not invented anything here that other folks haven't already discovered and written about. So much of agriculture is simply applying the lessons already learned by past generations. The best farmers I know work hard not to re-invent the wheel. Instead, they seek out information from those who have gone before, then apply that know-how to their own particular circumstances. That's what we're trying to do here. If you are interested in learning more about small-scale cattle production, that information is available to you too. Click here to see the books and periodicals we have used, as we have built our farm up from worn out ground to a diversified operation.